A photograph from a before a wedding at the Peak Edge Hotel during February. The makeup artist applies eye makeup to our bride during bridal preparations (the getting ready part of the wedding day) in the bridal suite at the Peak Edge Hotel. This was a fantastic, happy and friendly wedding at this spectacular venue in the Peak District south west of Chesterfield. We hadn't photographed a wedding here before this one and what a lovely place it is. 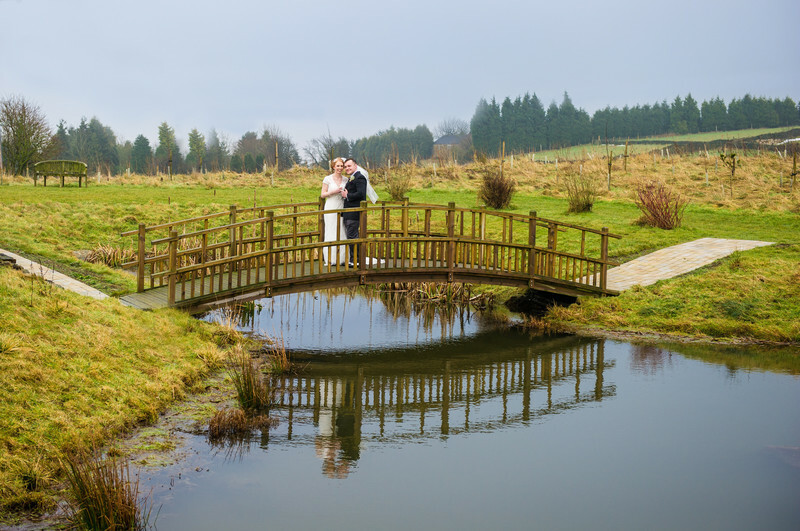 The grounds have a wonderful bridge over the lake which a great fun item to add into a collection of photographs. Not only are the grounds wonderful but the interior of the hotel is wonderful too. The bridal suite is a wonderful size with lots of room to spread out during the bridal preparations. This room also features a large window the full width of the room overlooking the front of the building, it was fun for the bride and her bridesmaids to watch her wedding guests arrive at the venue completely unaware they were being observed from above. This is a fantastic venue and we really enjoyed being part of this wedding day with a fantastic couple.